Rolls-Royce brand is the crowing jewel of automotive industry due to a number of reasons. Partly because the exclusivity is unmatched and that no two Phantoms would look the same, courtesy of the high levels of personalisation. The meticulous attention to detailing and the exquisite levels of craftsmanship are to behold. The fact that not everyone can buy it due to its humongous price tag, makes its even more special to see on the roads. The Phantom is as iconic as it gets, and cuts the mustard just like every other Rolls-Royce model. 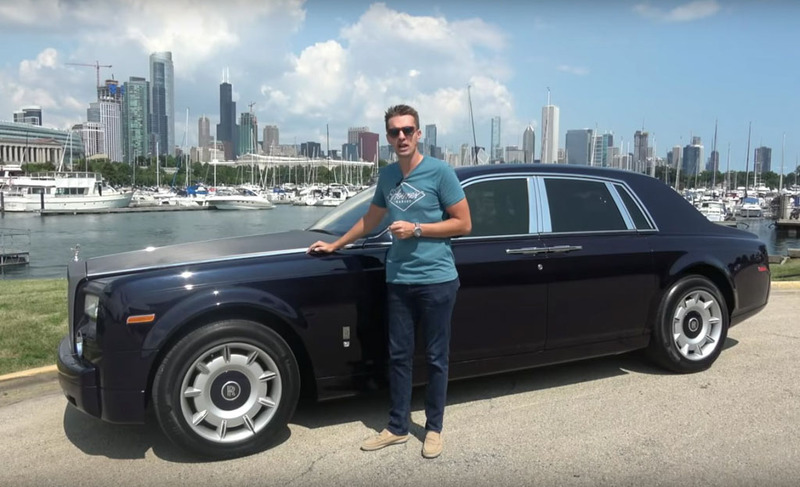 With only handful of Phantoms made each year, only a few buyers with obvious big fortunes can own them. Used Phantoms on the internet are a rare phenomenon but not all used Phantoms could be up for grabs as affordable as this one. Finding it online for below $ 100k is like discovering a treasure far beneath the earth’s surface. A 2005 RR Phantom for $80,000 (Rs. 55.07 lakh approx) was noticed by a guy from Hoovies Garage Youtube channel. He decided to flaunt his new machine in a brilliant video spanning over 15 minutes. It’s the bargain of the century considering that the latest Phantom costs Rs. 9.50 crore (ex-showroom) without taking customisation into account. You would be surprised to know it was a 13-year old model, as it looks to be in near pristine state. No body is prefect and I am sure you all will agree with that? The old Phantoms had electronic issues with ensuing problems on the sat-nav and adaptive air suspension. But does it really matter when a massive 6.75-litre V12 engine breathes just ahead of you under the bonnet? The naturally aspirated mill is still bonkers to creates an aura of a lifetime and it appears to be pretty well managed by the previous owner, at least until now. Other necessary functional elements are working just fine as you would expect. But, when the clock is ticking and you’re in a position to buy it, what would you do? Would you buy and bear the brunt of high owning cost of an old Rolls-Royce or simply sacrifice the bank account in the name of unrelenting pride?